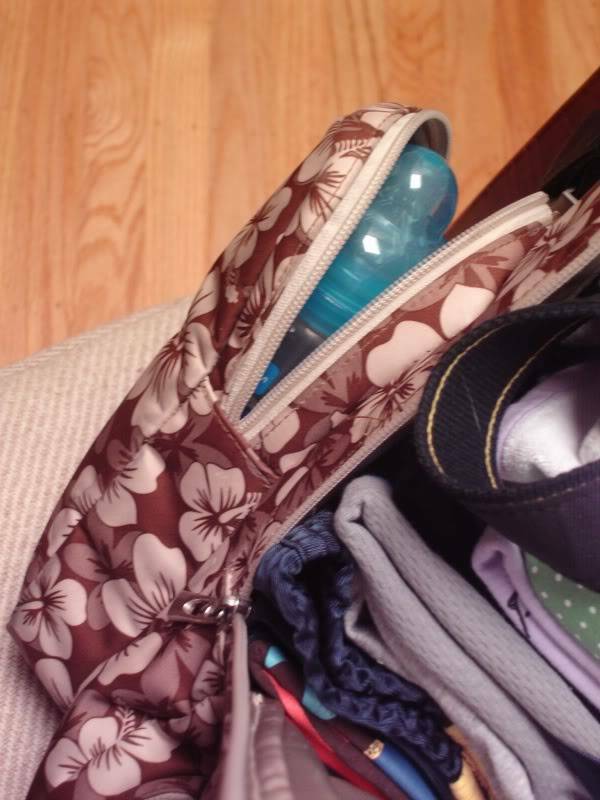 I received this diaper bag as a Mother’s Day present (08) from my husband and son and have been using it constantly since. 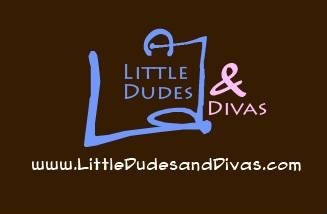 I have used and owned 5 other diaper bags. I’ve owned this item for 2 years and 1 month. I used this for my son up until he was 2 years old and now for my daughter as well who is 9 months old. I always pack 3 pairs of diapers each before my son was potty trained and daughter, 3 sets of change of clothes each, a whole pack of wipes (Costco size), sunscreen, eucerin, Neosporin, my glasses, my Be mine (mostly attached to the metal loop on backpack straps), son’s sunglasses, thermos for water or milk and jarred food. Sounds like a lot? 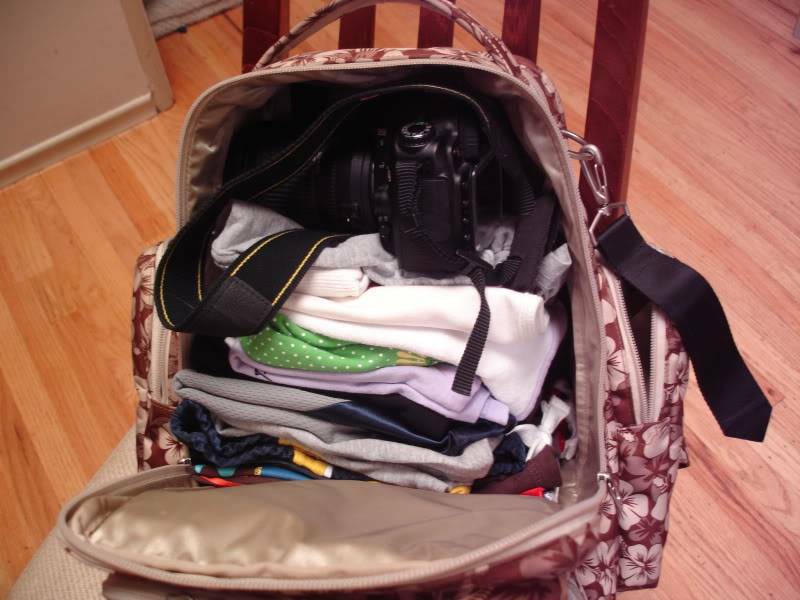 Yes but even with all these I have room to spare because our Nikon D80 goes on top of all the clothes. 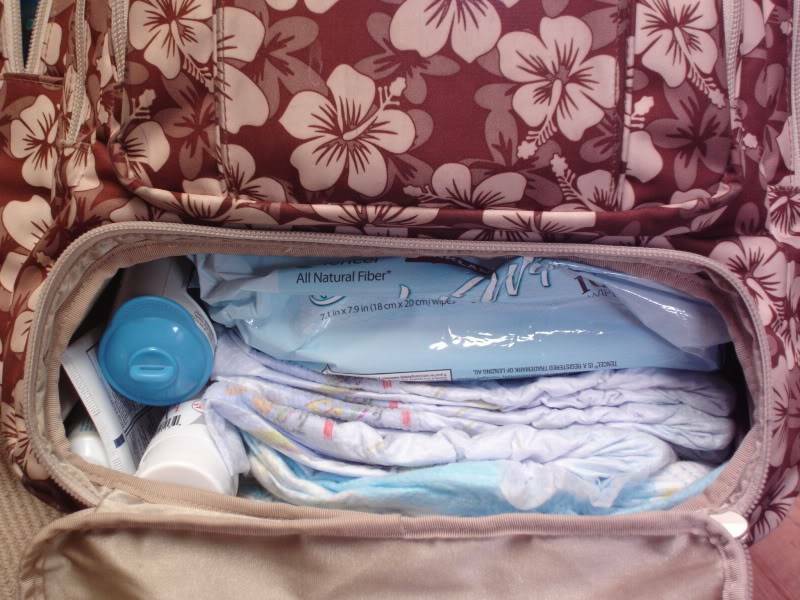 I love that this diaper bag has a ton of pockets and they are spacious and they are very functional. There isn’t a wasted space. I use all of the pockets except the mesh pocket in the main compartment. The main compartment is where I put all of the children’s clothes and some food and the bottom compartment for their diapers, wipes and creams. We use this diaper bag practically anywhere park, travel, mall, and anywhere we have to take the kids because it holds so much. It is our go-to diaper bag. Bottom compartment has 2 sets of diaper (I could put as many as 4 for each) for each child and other things diapering related items within convenient reach. The backpack straps are very sturdy and comfortable. I wear this backpack practically all the time, although it could be hooked up to the stroller with the included “Be connected” stroller clips, it is attached more to my back than the stroller. Yes, it’s that comfortable. I need our belongings to be strapped to me while I run after a sprinting toddler. The grab handle is so, so convenient for quick transfers i.e. from car to house, from car to car, without having to slide it into your back. My Be Mine attached to the backpack strap loop. I like everything about this bag, it was very well thought through; from the gusseted pockets, the numerous and spacious compartments, the magnet closure, the metal feet, the included pouch and stroller clips, the comfortable straps just to list a few. The weight of the empty bag is heavy but if it’s on my back I hardly notice it. We have a Tike Tech City X3 Twin and a Baby Jogger City Select. It simply attaches to the handle bar of our Tike Tech using the Be Connected stroller clips but I have not tried it on the BJ City Select. Husband loves the backpack straps as well as the grab handle (he complains that the other diaper bags don’t have this) but is too heavy for grandparents to carry. The material is Teflon coated so dirt does not readily stick. Definite plus. Cleaning the Be Right Back is a cinch, just wipe and your all done. The Be Right Back has withstood the weight and the constant slinging over one shoulder. 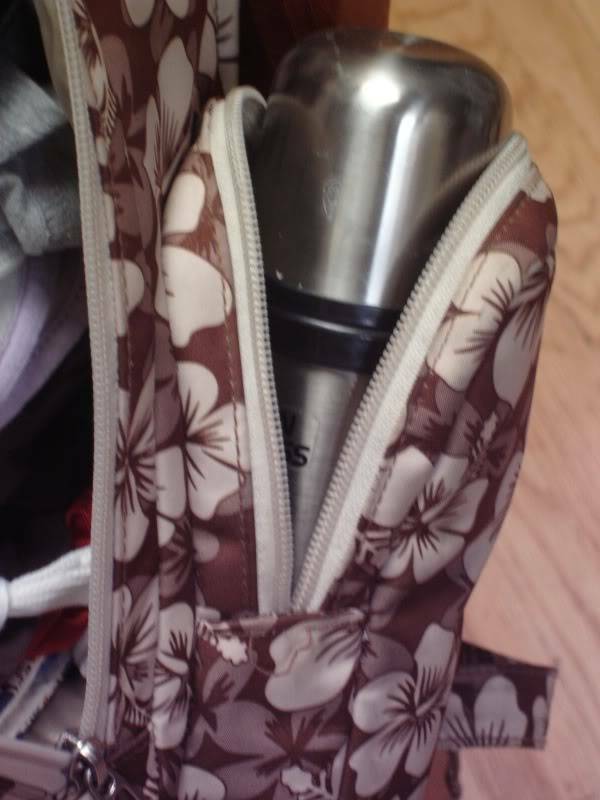 If this was any other diaper bag, the straps would have been ripped off at the seems like one of the ones I owned. It has also withstood sun exposure being on my back all the time. I have not seen any sign of fading. It was a present and did not know about it. 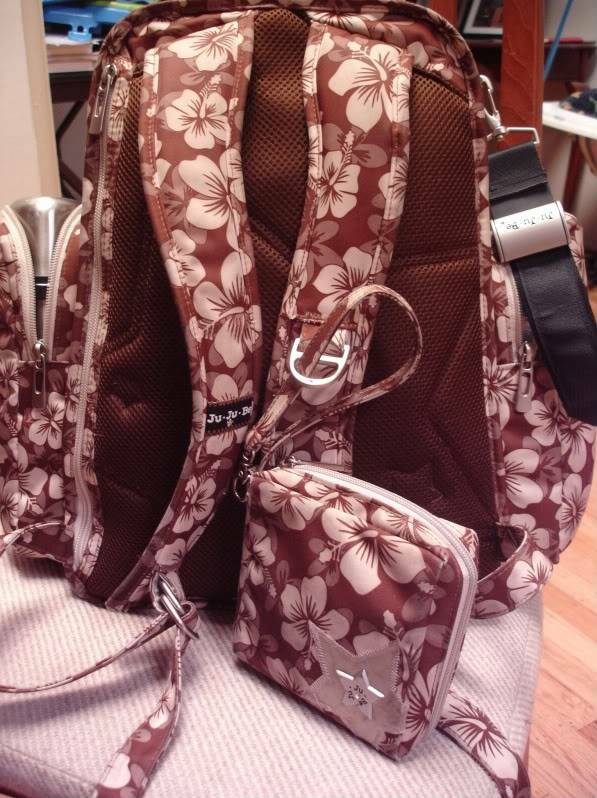 My husband introduced me to Jujube diaper bags and I have been thankful and hooked. 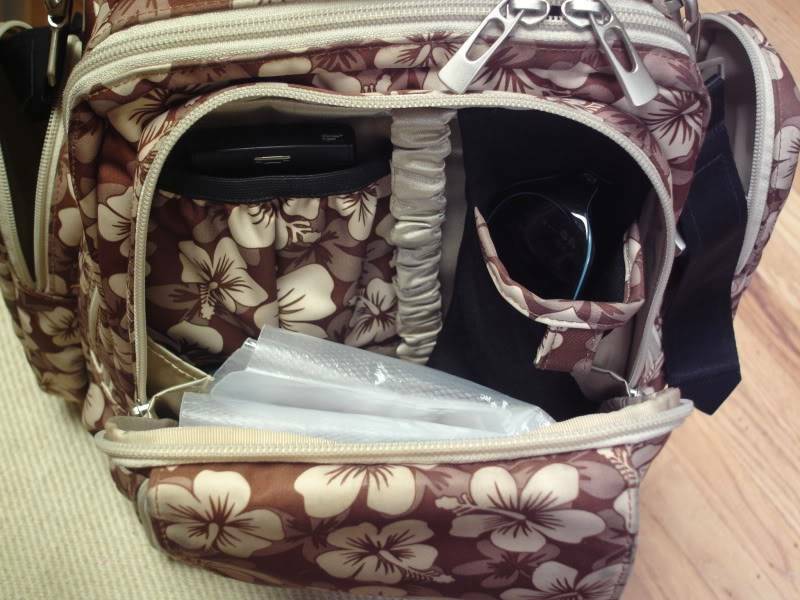 the mommy pocket with a blackberry and sunglasses, can't be seen but is in here are padded stroller straps, fluoride drops, wet clothes bag, energy bar for running after sprinting son, and set of keys.